Read one more chapter, pleeeaassee! 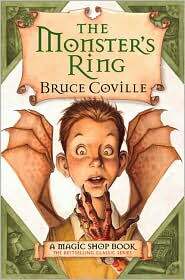 I am currently reading The Monster’s Ring by Bruce Coville aloud to my grade 3 class. They love the book and I love hearing them moan and groan when I stop reading for the day. 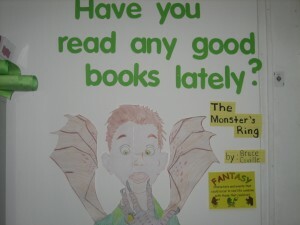 The story focuses on young Russell and the school bully he is eager to scare with the help of a magic ring that comes with instructions. With a twist of the ring, Russell begins to change into a Monster. If the ring is turned two or three times, more changes occur. This suspenseful plot leads the students to predict what Russell will look like after the ring is turned three times! Using Build Your Wild Self, an online tool that allows students to create a wild image using animal parts, the students were able to capture their ideas of Russell when he turned the ring three times and share them with the class. This is a great tool that I could see integrated with other books such as Where the Wild Things Are by Maurice Sendak and the Goosebumps books by R. L. Stine. Below is a picture from our classroom display as well as some samples from student created Russells using Build Your Wild Self. 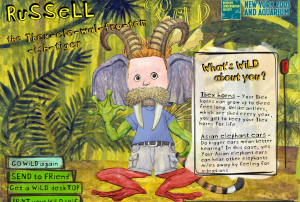 Have a go and build your own wild self! This entry was posted in integration, Reading, technology and tagged fun, read aloud, reading. Bookmark the permalink.